Since I moved to my new flat, I have a problem when heating bread in any way. What happens is that if I put it on a plate, it gets very wet on the plate side. This is so acute that drops appear on the plate. If I put paper around the bread, both get wet. The only way I found to get dry heated bread is leaving it in the toaster/grill until it is cold... but then it is obviously cold! What can I do in order to get warm and dry bread? The moisture in your toast is coming off the toast and then is getting condensed into the cold plate just like a glass of ice water attracts the moisture from the warm air around it. If you heat the plate, the moisture will not condense on top the plate. 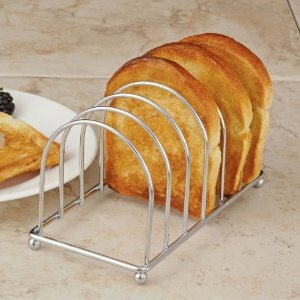 By maintaining air gaps between the slices, the toast rack allows water vapor to escape from hot toast instead of condensing into adjacent slices and making them soggy. However, this increased air flow can also mean that the toast becomes cold more quickly. My personal preference is to simply not heat up the toast until I actually want to eat it... and then pop it directly from my toaster into my mouth... with a quick stop for butter and jam on the way. The reason your toast is getting moist is that the cold plate is causing the water in the air trapped in the bread to condense into a liquid, you need to keep the toast off the plate and let the air circulate. 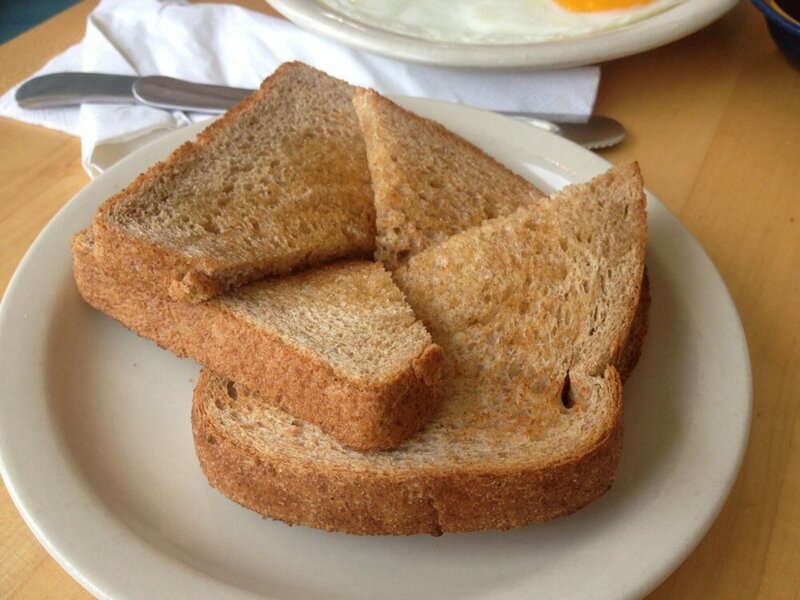 The method I use is to lean 2 pieces of toast against each other in a T shape before buttering. After buttering I put the toast on the edge of a plate with a raised lip, the raised lip will keep the toast off the plate and keep it from getting soggy. Another option you could try is to "pinwheel" the toast... but this only works if you're planning to cut it anyway. I've seen a lot of restaurants do this and I think it helps with the moisture/sogginess by limiting the amount of toast touching the plate. Hotels frequently serve toast atop a paper napkin (a paper towel would do). This presumably absorbs the moisture that would otherwise condense on a cold plate. Expensive places occasionally wrap toast in linen napkins which has the advantage that the toast does not get stuck to paper. Not the answer you're looking for? Browse other questions tagged bread heat or ask your own question. What qualities should I be looking for when making the best French Toast? Why did my French bread neither rise nor bake properly? Effect of adding wet ingredients to dry when making bread? Is my biga supposed to be liquid? Is it possible to bake bread or the like using a stovetop tagine? What's the point of long/complex sourdough feeding techniques? Why is my gluten so weak?